Bake in oven for 9-11 minutes in a 375 degree oven and a non stick cookie sheet. 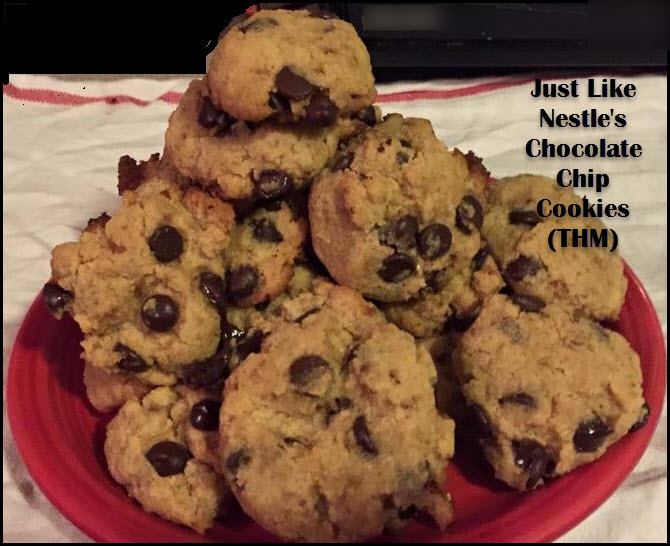 These are the best sugar free low carb chocolate chip cookie I have made so far!! Really taste like toll house😊. My hubby thought they were the real deal! Thank you so much! I’m so glad you both enjoyed them!!!!! I make a very tiny commission to help me fund this blog. Are these considered an S? Yes, they are a an S! I used the baking blend from Briana Thomas’s blog, and followed the recipe as shown but they turned out completely flat, and very soft. Wonder what I could have done wrong? Did you include baking powder? That’s what makes them rise a be fluffy. I don’t see baking powder in the recipe, I see baking soda. Also, how many cookies does one recipe make? I apologize! I get baking soda and baking powder confused sometimes! It doesn’t have baking powder! I would try 1 tsp of baking powder to fluff them up a bit. You know what, it’s been awhile since I made them. (I tend to eat too many!) Let me try making them again this weekend as my daughter has been begging me to make chocolate chip cookies and see if they are the same. I want to say that the texture was more like Nestle and less cakey, but I’ve had people tell me that they are great and a few others tell me they came out a bit flat. What is the THM Baking Blend? It’s a special blend of flours that are easier on your blood sugar levels. I have been a trim healthy mama for a year and a half. My cry turned into a prayer for COOKIES!! So many delicious recipes out there, but nothing has hit the mark. THIS, my friend, is absolutely GeNiOuS!!! May you be blessed 10 fold!! Any ideas of a different sweetener? I have Xylitol, Swerve, Pyure but not erythitol. I believe Swerve is the most similar to it. WhaT is the brown where do you get Lilly’s chocolate morsels and can you use the mama blend stevia? The brown sugar is from Gwen’s Nest. There is a link to it on the page. You can use the blend mama stevia I’m not sure how much though. I loved these but they were so crumbly. I wish they would stay together. Does this recipe need vanilla extract? Most cookie recipes call for it which is why I am asking. I went by the Nestle website recipe.